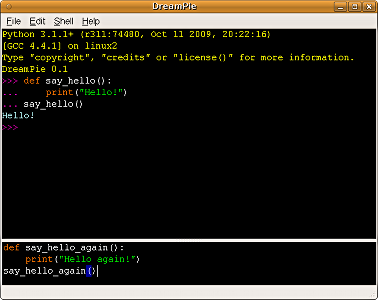 * DreamPie features a new concept for an interactive shell: the window is divided into the history box, which lets you view previous commands and their output, and the code box, where you write your code. This allows you to edit any amount of code, just like in your favorite editor, and execute it when it's ready. You can also copy code from anywhere, edit it and run it instantly. * The Copy code only command will copy the code you want to keep, so you can save it in a file. The code is already formatted nicely with a four-space indentation. * Features automatic completion of attributes and file names. * Automatically displays function arguments and documentation. * Keeps your recent results in the result history, for later user. * Can automatically fold long outputs, so you can concentrate on what's important. * Lets you save the history of the session as an HTML file, for future reference. You can then load the history file into DreamPie, and quickly redo previous commands. * Automatically adds parentheses and optionally quotes when you press space after functions and methods. For example, execfile fn automatically turns into execfile("fn"). * Supports Python 2.5, 2.6, 2.7, Jython 2.5, IronPython 2.6 and Python 3.1. * Extremely fast and responsive.